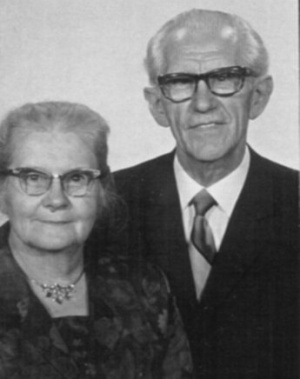 Hugo Cornelius Scheffler: Mennonite pastor and Aeltester; born 18 February 1901 in Kronsnest, West Prussia, the fourth of eight children born to Cornelius Scheffler (12 March 1864, Marcushof, Klein Werder, Prussia - 27 February 1937) and Marie (Goerzen) Scheffler (d. 28 March 1901). Hugo married Susanna Janzen (6 April 1906, Nikolajewsk (Ebenthal), Memrik, Russia) - 31 January 2001, Bellingham, Washington, USA), daughter of Martin Johann Janzen (1856-1912) and Helena (Enns) Janzen (1873-1917), on 28 March 1928 in Preußisch Rosengart, Klein Werder, Prussia. They had four daughter: Hildegard, Gertraud, Eva Marie, and Ruth (a son died at the age of six). Hugo died on 20 January 1977 in Bellingham, Washington and was buried in Ferndale, Washington. Hugo was baptized 24 May 1915 in the Mennonitengemeinde Thiensdorf, West Prussia where he was active in Sunday school and youth work. He attended the Missions Schule (Bible seminary) in Wernigerode (Harz) Germany, from 1924-26. Here he received a good foundation in Bible knowledge and exegesis and was also influenced by his teacher and mentor, Jakob Kroeker, with a love for the universal body of Christ and his word. In Wernigerode he met Susanna Janzen. Hugo and Susanna were married in 1928. Both of them worked on his father's second farm for a year. In 1929 he applied for a pastoral position in Sembach, Germany and served that Mennonite congregation from 1929 to 1935. In 1935 the Mennonite congregation in Kaiserslautern called him and he was their pastor from 1935-1951. During World War II Hugo was exempted from military service to care for four additional Mennonite congregations whose pastors had been drafted into military service. With devotion he visited his flock in the different mountainous villages and towns on foot or with his bicycle or small motorcycle. He also served as a medic in bomb-stricken towns and villages. In 1951 they immigrated to the United States. Hugo attended Bethel college in 1954 for two semesters on a scholarship to improve his language skills and become acquainted with American academic life. He preached occasionally in his home congregation, Ritzville, Washington. In 1954 he received a call from a German-speaking Mennonite parish in Black Creek, BC, Canada and a year later from Clearbrook, BC, where he ministered until 1963. With humility and open-mindedness that had characterized him all his life, he accepted a challenge to teach at the Bienenberg Bible School in Switzerland from 1963 until 1966. During summers he worked as itinerant pastor in several German congregations and as a visiting shepherd and teacher to Mennonite Central Committee volunteers in Europe and Africa. After his return to USA Hugo was called back to serve as a conciliator and interim pastor in Berlin and later in the Mennonite refugee congregation in Enkenbach, Germany. He was liked by his parishioners, especially by young people, for his openness, honesty and sense of humor. He returned in 1968 to retire officially in Bellingham, WA but he was still active in conducting deeper life services in several congregations across Canada and speaking at numerous ministerial conferences, sharing from the wealth of experience during a rich life in God's service. There was always renewed vigor and spirit in his writing, teaching and his relationships. For 22 years Hugo participated in writing the Bibel Studien Fuer Erwachsene (German Sunday School Lessons for North and South America). From 1971-1977 he was the sole author. He died in January 1977 of cancer. "Aelt. Hugo C. Scheffler." Der Bote (15 March 1977): 7, 12. GRANDMA (The Genealogical Registry and Database of Mennonite Ancestry) Database, 7.04 ed. Fresno, CA: " California Mennonite Historical Society, 2013: #351609. "Rev. Hugo C. Scheffler responds" to "Ein Wiedersehn und doch keins." Der Bote (17 January 1967). Lemke, Helmut. "Scheffler, Hugo Cornelius (1901-1977)." Global Anabaptist Mennonite Encyclopedia Online. April 2002. Web. 26 Apr 2019. http://gameo.org/index.php?title=Scheffler,_Hugo_Cornelius_(1901-1977)&oldid=101952. Lemke, Helmut. (April 2002). Scheffler, Hugo Cornelius (1901-1977). Global Anabaptist Mennonite Encyclopedia Online. Retrieved 26 April 2019, from http://gameo.org/index.php?title=Scheffler,_Hugo_Cornelius_(1901-1977)&oldid=101952. This page was last modified on 1 October 2013, at 08:35.